I assume that even my casual acquaintances know about my obsession with books and reading, but I guess there are still people out there who don’t know the exact extent (it’s kind of refreshing, really). When I went around taking an informal survey of coworkers and friends this week asking them, “What books are you thankful for?” there were a lot of raised eyebrows and confused looks. On the other hand, I did get a couple of thoughtful/helpful responses, and in one case, was gifted a book (A Distant Grief by F. Kefa Sempangi)(thanks sister-in-law!). So, a couple of days late… here are the books I’m thankful for right now. Looking at the collection of titles, this list could also double as “a history of Cecelia, in books.” My hope is that by this time next year I’ll have ten new books to add to a list like this – and more diverse ones. 1. Corduroy by Don Freeman – One of my favorite picture books from childhood, and now a staple for baby shower gifting. Not is it a universal “lost toy” story, but the main characters are WOC. Ensuring that the little ones in my life read and see stories with as many diverse characters as possible is a personal mission of mine. 2. Bible – It’s cliché, but I am thankful for all of the time I’ve spent with this book. I value the lessons I’ve learned, the comfort I’ve gained, and the literary illusions and history I understand because of my background with it. 3. Magic for Marigold by L.M. Montgomery – My favorite L.M. Montgomery book because I read it first. I also credit this book with giving me very specific ideas about acceptable hospitality (there must always be cake in the house! ), family politics, and how friendships evolve over time. 4. A Girl of the Limberlost by Gene Stratton Porter – I read this book multiple times a year for years… I’ve re-read it more than thirty times. I put its charm down to super-independent female characters and wish fulfillment. 5. The Lord of the Rings by J.R.R. Tolkien – Some of the first fantasy I picked up on my own without prompting or my mother reading it aloud first. I liked it so much that I tried to find more of the same, and it set me on a lifelong search for and love of fantasy. 6. Patricia C. Wrede’s young adult fantasy – After I fell in love with fantasy I used to browse the shelves of my local library looking for likely book covers, and that’s how I found Patricia C. Wrede and my first young adult fantasy. I’ve been a fan ever since, and I used Wrede to find other favorites like Robin McKinley and Garth Nix. 7. Harry Potter series by J.K. Rowling – Look, I won’t say that I grew up with Harry Potter. I was a bit too old to be in that crowd. But I did read the books eventually (in grad school), and I talked about them with my siblings and we all went to see the movies together over holidays when I was home. So not only did I love the books, they helped me bond with my family. Priceless. 8. Susan Elizabeth Phillips’ romances – Speaking of bonding, my sister and I used to share SEP’s books with each other. They’re funny, intelligent stories (if a little unlikely! ), and one of us would buy and read the book and then send it off to the other. That was a nice change after a childhood where Ginny wouldn’t read anything I said was good. For a passionate reader, that was frustrating! 9. C.S. Lewis’ Mere Christianity – I’m thankful for this book because it was one of the first books I read that dissected my faith in a way that stripped out the emotion of experience and made logical sense. I go back to this book when I am overwhelmed by the (seeming) American evangelical Christian monolith, or when I find myself judging instead of loving. It’s wise and simple and a good tonic for pride. 10. Check, Please! webcomic by Ngozi Ukazu – One of my best finds of the past two years (thanks, tumblr! ), this webcomic combines many of my interests: baking, hockey, and a happy, fluffy love story. Many days over the past year have been made 100% better by a comic update. I can’t recommend it enough! What books are you thankful for? This post was inspired by The Broke and the Bookish's Top Ten Tuesday. Shortly after I moved to the DC area I joined the DC chapter of the Forever Young Adult book club (DC FYA for short)(I may have mentioned this fact before?). The girls from book club have become good friends, and they are really sweet about the fact that I often show up without having read the book (or when I skip a meeting, like yesterday! Eek!). I trust them for recommendations. 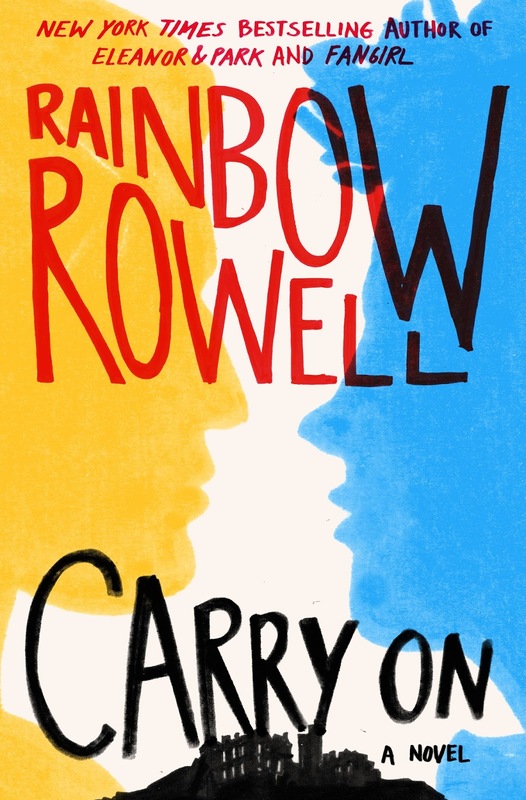 Melissa-from-book-club insisted that I would like Rainbow Rowell’s Carry On, and I knew she was probably right. I wasn’t in the mood to read it at the time, so I sat on the recommendation for a few months. Then on my flight home from France I saw it on my Kindle app and thought, “Yeah, I’ll try that.” Seven hours of travel later, I was almost home and exhausted, but with that happy I-just-finished-a-fun-book feeling. Simon Snow is the worst Chosen One who’s ever been chosen. That’s what his roommate, Baz, says. And Baz might be evil and a vampire and a complete git, but he’s probably right. Half the time, Simon can’t even make his wand work, and the other half, he sets something on fire. His mentor’s avoiding him, his girlfriend broke up with him, and there’s a magic-eating monster running around wearing Simon’s face. Baz would be having a field day with all this, if he were here—it’s their last year at the Watford School of Magicks, and Simon’s infuriating nemesis didn’t even bother to show up. Carry On is a ghost story, a love story, and a mystery. It has just as much kissing and talking as you'd expect from a Rainbow Rowell story — but far, far more monsters. Carry On is the story of Simon Snow, a “Chosen One” with a temper, and his final year at a magical school. If that sounds familiar, you’re not imagining things. Simon was originally introduced to readers through fan fiction about a fictional book within another of Rowell’s books (Fangirl), and it was meant to be a Harry Potter-esque story. If that last sentence didn’t make sense to you, it’s fine: You don’t need to have read anything previously to ‘get’ Simon’s story. It’ll feel familiar no matter what because it is a loving send-up of some of fantasy’s well-worn tropes. As mentioned above, Simon is back at his magical boarding school for his final year. He expects life as normal (or as normal as his life gets): foiling his roommate Baz’s evil plots, proving that Baz is a vampire, and figuring out what the next threat to his life from the Big Bad in his world will be. Then Baz has to go and spoil it by not showing up (the nerve!). Life goes on, but Simon just can’t let Baz’s mysterious disappearance go. Add in ghosts, not-dealing with his girlfriend-who-probably-cheated-on-him-with-Baz, and magical deadspots of increasing size, and you have a recipe for angst and apocalypse. So those are the bare bones of the plot. What’s the book like? It’s delightful and yet predictable. How does that work? Good points: it’s well-written, it’s funny, it’s meta, and it’s told from multiple perspectives, which adds a thin slice of mystery to some events which might otherwise be completely unsurprising. As I said, though, it’s not particularly surprising or groundbreaking, though now that I write that I don’t think I can name a young adult fantasy novel with gay boys and a happy-ish ending. * So maybe it IS groundbreaking?! Let me know in the comments if there are titles I’ve overlooked. When I say it’s predictable, I mean that I knew what was coming around every corner before it arrived, but that doesn’t mean I didn’t still enjoy it. Things that I thought were particularly well done: characters with varying levels of self-awareness and intelligence (instead of a cast entirely made up of self-possessed/talented teens – it was a welcome change), LGBTQ love story (I don’t think that’s a spoiler – you can see it coming a mile away! ), female characters of various ages and awesome, family foibles, and diversity (in fantasy!). Rowell is also very talented at writing banter and dialogue in general – you hear the different voices of the narrators loud and clear. This is a parody of popular fantasy, so the magic is exceedingly silly, but the author did enough worldbuilding that it worked. At least, it did if you imagined Rowell sharing the joke with you. She didn’t take herself too seriously, and that light-hearted feel contrasted nicely with the world-ending stakes. In all, Carry On is a fun and funny diverse read that’s perfect for turning off the real world for a bit and enjoying a trope-tastic magical alternative. Recommended for: fans of Sarah Rees Brennan’s Lynburn Legacy series, Gina D’Amico’s Croak (and fantasy in general), and anyone who appreciates good dialogue and a sarcastic narrator. *ETA: I've done a bit of looking and found several books (gayya.org has a lovely masterlist), and I've even read some of them, so I was clearly a little out of it while writing the review. A book I'm in the process of reading (The Rest of Us Just Live Here) fits the criteria, for goodness' sake! Sorry all. Still, send me your recommendations! I clearly need to read more (and more carefully). how did i turn out this way? well, i read books. It’s been a while since I truly focused my energy on this blog. After the week we just had here in the USA, I wanted to write and write and WRITE all of my feelings out, but Twitter and Facebook didn’t seem like the place to do it. I’m more of an observer on those networks. I saw the lovely Aarti of BookLust mention that this week made her want to go back to her blog, and I thought: yes, that’s it. I’ll blog. One of the reasons I grew up a passionate reader and book advocate is that my family encouraged it. My mom and dad read aloud to my siblings and me. Bookstore visits were a special treat after a job well done. My mother homeschooled me from 3rd through 8th grade (ages 9-14), and we visited our local library almost every day during that span. I always checked out the maximum amount of books allowed. I think that environment was absolutely ideal for growing a crop of readers (and thoughtful human beings! ), and I’m thankful that my parents devoted so much time and energy to making that a reality. I know I was lucky and privileged. Books can open your mind and your world. Along with being super-involved in my education, my parents were (and are) very religious. They fit that white evangelical voter profile. My beliefs and priorities have shifted over time (thanks in large part to reading a lot, and widely). They’ve doubled down. I watch and learn from people with different life experiences on social media. We’ve listened to different stories and sources. To keep the peace during my brief visits home, I often stayed silent (and I own that). It lead to a lot of tension, and on my part, a deepening resentment and sadness. When you think that your family won’t approve of your politics, it’s hard. When you believe that your politics will lead them to question your salvation… well. This week I faced the fact that though I love my family, I haven’t been honest with them about who I am and what I believe in almost a decade. And that’s not okay. I’m in my thirties(! ), and I feel way too old to hide anything. I had my most open conversation with them in years on Thursday. End result? I won’t be going home for the holidays. Silver lining: I freed myself of a long-hidden hurt, and I feel like I'm in a place to speak up without guilt. Even though this week has been awful in many ways, I hope I’ve grown a bit as a person. And I hope that I’ll be here, writing about books (especially diverse ones!) more often going forward. Let me know if you’ve read anything amazing recently, ok?